Business today is more than just global-it's increasingly decentralized. Advances in mobile technology have made it easier than ever to be productive beyond the confines of a traditional office space. 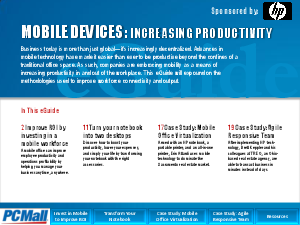 As such, companies are embracing mobility as a means of increasing productivity in and out of the workplace. This eGuide will expound on the methodologies used to improve workforce connectivity and output.